‘Mini-beasts’ is a popular summer term topic in infant classes around the country. Young children will be learning about these amazingly resilient creatures and the fantastic things that they achieve. Mini-beasts show tremendous backbone, despite not having an actual backbone, being incredibly small and easily squishable. Currently, there are a lot of news headlines about the pressures on teachers and the impact of excessive workload, in particular, on people’s mental health and wellbeing. I wonder what teachers and support staff can learn from mini-beasts, especially ants, about managing our workloads more productively? Ants camouflage themselves by constructing hills of dirt over their underground nests, to avoid unwanted attention. How often have you got your Planning, Preparation and Assessment (PPA) or after-school time mapped out, only to be disturbed by a colleague who fancies a chat? Whilst it is good to talk, and we all need to offload, it can be frustrating when you are still buried under a pile of marking, as said colleague floats, like a butterfly, out of the building. Agree with colleagues that, if your door is closed a couple of times a week, it means you’d rather not be disturbed. Sit around a corner in your classroom, out of sight; with your back to the door or, better still, with headphones on. Invite your chatty colleague in and explain that, as long as all of your jobs get done, you’d love to catch up. Then hand them a staple gun and work, to put up on display! 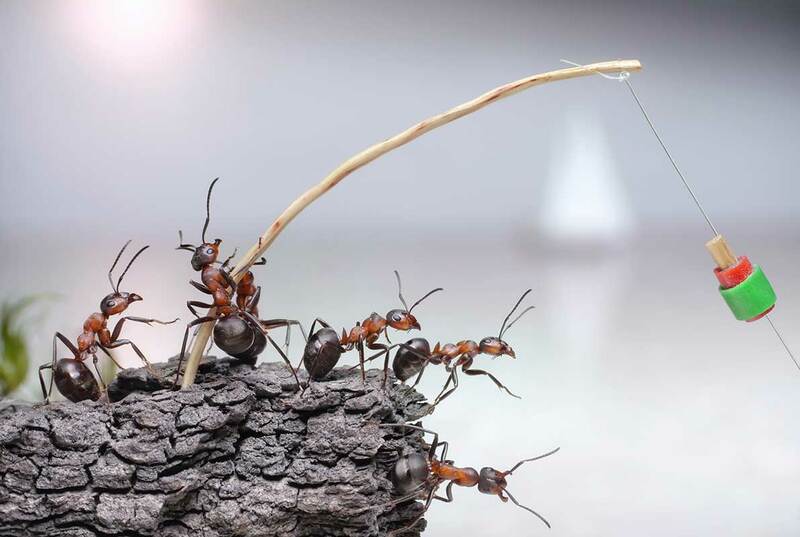 Foraging ants leave a pheromone trail so that they, and others, know where they’ve been. Now, I’m not suggesting that you secrete a chemical substance every time that you go from your classroom to the photocopier and back - that would just be yucky! But, if you did, I wonder how much of the trail would indicate time spent ‘flitting’ because you’ve forgotten something, or queuing, because you need to print off 30 sheets when everyone else does? Our brains work in auto-responsive mode most of the time, and we carry out daily tasks without too much thought. By slowing our brains and bodies down, and planning our printing, photocopying and resource-collecting trips round the school a bit more thoughtfully, we are likely to save ourselves quite a bit of time, as well as shoe leather. Ants like the scent and taste of sugary things, but are also partial to grease. They enjoy munching on a picnic, as much as rummaging through the rubbish bins. Most of us like a list. But how many of us tend to procrastinate and downright avoid the jobs on our list that we consider to be tricky, mundane or time-consuming? If you are a person who does all of the sugary, picnicky, enjoyable jobs first, then it’s highly likely that the unticked tasks will weigh more heavily on your mind than they need to. The longer you put them off, the harder it will be to get started and the bigger they will become in terms of being a problem. By being more ant-like, and mixing up the lovely jobs with the greasy, rubbish bin ones, you will work through your list more quickly and productively. Every time you tick off a job, especially the more challenging ones, your body will release dopamine and serotonin to say: ‘Well done you!’ Hence, spurring you on to the next task. Each little ant makes a huge contribution to the work of the colony. They are amazing team workers. There are very few people in schools who do not want to pull their weight and make a positive contribution. However, when we are busy, we sometimes get into the habit of trying to do everything ourselves, as it takes time to explain tasks to someone else, or we worry that they might not do jobs quite to our liking. As teachers, we should initially invest time to talk through our lesson plans and the marking policy with support staff, or model how we want displays to be put up. Then teaching assistants will understand our expectations, be empowered to support us even more effectively and may well be able to contribute more creative ideas to plans and displays, which will benefit the children. So, the next time you are buzzing around like a busy bee... STOP, and be more ant-like. At Laughology, we deliver a range of training sessions which support schools to become happier places and help staff to improve their life-work balance and wellbeing. These are not ant related! Sarah Creegan, a former headteacher, is now a consultant and supports school improvement and the emotional well-being of pupils, staff and school leaders. She delivers workshops and training and is a particularly effective mentor and coach.